Upholding a long-standing tradition of showing us things in space that we have never seen before, the Hubble Space Telescope recently witnessed the break-up of an asteroid. Asteroid P/2013 R3 was discovered in the Catalina and PanSTARRS sky survey data on September 15th last year. When follow-up observations were made by the giant Keck telescope in Hawaii, three separate objects traveling together within a cloud of dust the size of Earth were revealed. This elevated the level of interest in the object to warrant a look at it through Hubble. Through the looking glass of Hubble's optics, things grew curiouser and curiouser…. Hubble's perceptive eye made out not three, but 10 distinct objects moving in a pack, the four largest chunks as big as 400 meters across. Also, the fragments are separating from each other at a stately one mile per hour. This could only mean one thing: the small mountain of rock was caught in the act of disintegrating, an event that we had previously only observed in the more fragile and heat-sensitive objects we classify as comets. Once upon a time, our rudimentary ideal of asteroids was of giant rocks wheeling through space, ranging from house-sized bits to megaliths hundreds of miles across. Most of them are found in the Asteroid Belt between the orbits of Mars and Jupiter, though many have been found roving outside of those bounds and even interloping on Earth's orbit. Over time we have discovered many thousands, and expect their actual numbers to be in the millions. When we think of giant rocks, we tend to imagine singularly solid objects, maybe like El Capitan or Half Dome in Yosemite: robust geological titans that stand up to time, gravity, and the forces of weathering with enduring strength. But time, and lots of observations by spacecraft like Hubble, robotic probes and ground-based telescopes, have taught us that asteroids, like many things, are usually more nuanced, complicated and just plain interesting than our initial simplistic ideals. We already knew about an asteroid named 3200 Phaethon that exudes a trail of dust as comets do, earning it the moniker "rock comet." 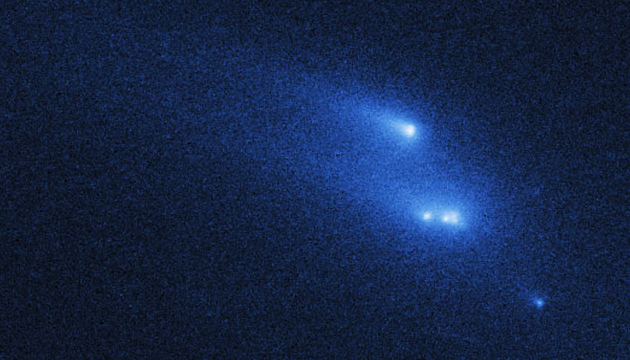 Another asteroid, P/2013 P5, was recently observed to spout six comet-like tails! Spewing out dust and comet-esque tails is unusual behavior for asteroids, but what happened to P/2013 R3 to cause it to completely break apart? Did it collide with another asteroid? Not likely. Though asteroids do occasionally collide with each other, the fragments of P/2013 R3 should be flying apart much faster if a violent collision were the culprit. Did internal forces pry it to pieces? On Earth weathering, the action of water, wind, and expanding ice, will gradually disintegrate a big rock like Half Dome or El Capitan. And, the heating and vaporizing of ices within an asteroid may be a mechanism related to the dust outbursts from 3200 Phaethon or the tail-growing behavior of P/2013 P5. But the complete crumbling of an asteroid by the expansion of internal vapor is also thought to be unlikely in this case. What does that leave, short of a scenario out of science fiction? Here's the nutshell of this idea: Uneven sunlight pressure gradually accelerates an asteroid's rotation to the point where stresses from centripetal forces cause it to "gently" fly apart, especially if the asteroid's structure was already weakened, perhaps due to a collision with another object sometime in the past. If you've ever seen one of those sunlight-driven propellers ("radiometers") with the black and white colored sides then you've seen how an imbalance of solar radiance can make something move. "Solar sail" spacecraft have been envisioned that take advantage of sunlight pressure for propulsion, and even existing spacecraft (Mariner 10 for one) have employed the technique to turn. NASA may also use sunlight pressure to stabilize the attitude of the broken Kepler spacecraft. We're not sure that this is what happened to P/2013 R3, but it's a plausible scenario that matches up well with observations of the breakup. At least, Hubble didn't spot any Death Star space stations lurking in the area.